Have you found your soulmate? What's on your lover's mind? Are you on the right path in your career? Call Oscar Brock and uncover the truth! Oscar Brock can see into your heart and help you discover and realize your deepest desires while conquering your fears. Born in the Midwest, Oscar traveled the world to learn the methods of divination that would best hone his psychic gifts. He offers his talents so that you might find the truth you are seeking. Oscar studied at the Ross Common School for Druids in Ross Common, Ireland. He is initiated in the British Druid Order, and a member of the Church and School of Wicca. 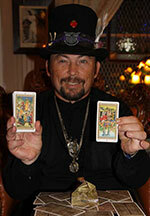 He has read tarot and other oracles for over 40 years. Let him put you on the path to success and discovering the real you. Oscar Brock is unavailable ... but you can arrange a call back!